We are continually striving for excellence in order to provide patients with the highest level of dental care in a warm, comforting environment. Dr. Book graduated from the Faculty of Dentistry at the University of Manitoba in 1988. He received a Bachelors of Science in Dentistry and a Doctor of Medicine in Dentistry. Immediately following graduation he completed an internship in Toronto at the prestigious Hospital for Sick Children. After a few years in private practice in Toronto Dr. Book was attracted to the beauty of the West Coast and came to Vancouver in 1991. He has been practicing on Dunbar for the past 21 years. He is involved in all areas of general practice. He believes continuing education is the key to being able to deliver the most current and best possible care to his patients. He is actively involved in three study clubs: a full-mouth rehabilitation group,a periodontal surgery group and an orthodontic group. As senior member of these groups, Dr. Book enjoys sharing the knowledge he has acquired. He frequently attends additional courses and conventions and routinely logs in excess of 90 hours of continuing education per year. In recent years Dr. Book has been focusing more on esthetic rehabilitation. Rejuvenating people’s smiles has proven to bring great satisfaction and joy to all involved. See our smile catalog for what this area of dentistry can do. Dr. Book and his wife have two teenage sons. Dr. Book is avid runner. He has completed many marathons. His new interest is road cycling and he is planning to participate in the Gran-Fondo ride to Whistler this fall. He enjoys skiing as much and as often as he can with his family. Dr. Pamela Davidson graduated from UBC dental school in 1996 and since then has been striving to keep herself well educated on the newest techniques and materials. As her career has progressed she has become more interested in cosmetic and complex restorative cases, including implants and has made a commitment to continue her education in these fields. However, Dr. Davidson has also come to appreciate extended care and the importance of what is done now and how it will affect your health in the future. Dr. Davidson strives to provide the highest quality of care for all of her patients and she is honored that so many people trust her to be their dentist. Dr. Davidson works hard to get to know her patients and to individualize their treatment based on their dental needs and desires and to work within their levels of financial and personal comfort. Prevention is often the key to great oral health. Small problems are usually easier and less expensive and time consuming to fix and regular checkups help her to find and deal with things early. She is also dedicated to keeping your mouth healthy, functional, pain-free and beautiful throughout your life. Determining and assessing certain risk factors now will help her to keep you healthier in the future. If you haven’t been to a dentist for a number of years, or are nervous or embarrassed by the state of your teeth, don’t worry. Making that first appointment for an exam or consultations is the most important step and the best thing you can do. No problem is too big or too small to handle, and Dr. Davidson will work with you to find the best solution. 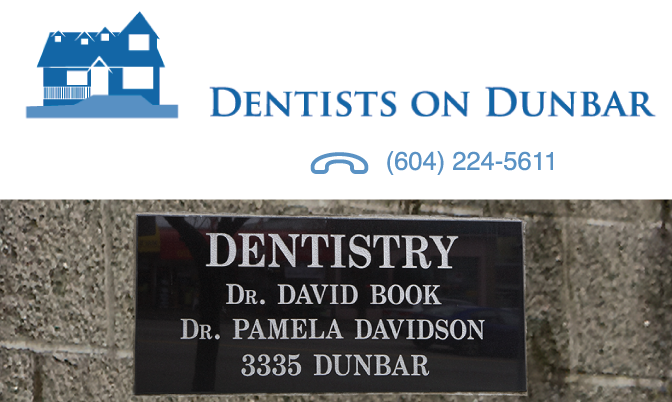 Dr. Davidson has lived in the Kitsilano and Dunbar area for over 20 years, and is the happy mother of 2 very active children. Dr. Davidson and her family enjoy skiing, theatre and traveling.